Firstly a massive thank you for designing and building the new Sevenoaks Drum School studio. The results you achieved are simply incredible. I knew the results would be impressive after visiting one of your previous client’s studios. When I experienced the results you achieved on that particular build I new I was following the right path in placing a booking with you. You are truly experts in your field and I am absolutely thrilled that you were able to build a bespoke soundproof drum studio for me. The performance results are even better than expected! The whole Amadeus team have been great to work with from start to the finished product. Throughout the entire process I had ‘a number’ of questions and concerns about the build, given that the aim of my studio design was to keep the volume of loud drums from transferring outside. The team were always friendly and prompt in replying to my queries and welcomed me to your offices for our meetings. Before I placed an order with you I did a lot of research online regarding soundproofing and building studios. I even drew up various design plans. It was always a concern as I learnt more and more about the soundproofing process that builders I used would not fully appreciate the detail necessary to achieve a soundproof structure. The Amadeus builders on site have been fantastic and absolutely passionate about their craftsmanship. As musicians too (drummers as it happens!) they appreciate the quality of work that is essential to achieve the required results which just put my mind at rest knowing the build was going to be a success. 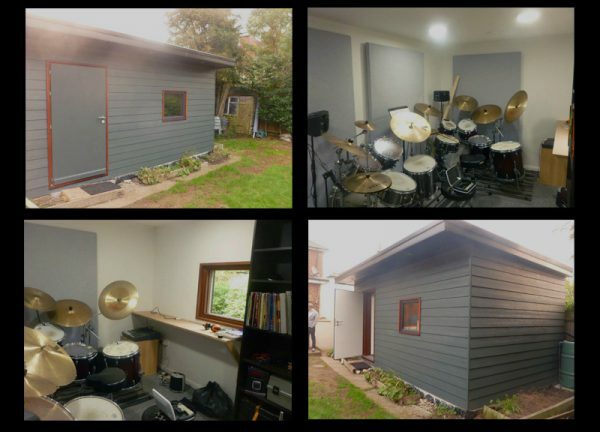 Using the soundproof studio for Sevenoaks Drum School has been a huge asset to my business, not only to not disturb anyone outside nearby but also as a beautifully built modern structure, is a spacious, light and airy environment to work in. In my first week of teaching in the studio it was priceless seeing the looks on my student’s faces! They absolutely love it. I can’t thank you enough for the studio, the results have blown me way. Outside of teaching hours I also use the studio for personal practice, recording and band rehearsals which have been either early in the morning or late at night. Whatever the time of day, it doesn’t matter anymore; no one will hear me!